Dog.com, online also at dog.com, is the ultimate place to shop for anything and everything you need for your dog. Dog.com has a huge selection of dog supplies and your sure to find what you need. Choose from a fabulous selection of dog food, treats, crates, toys, beds, collars and more. You’ll even find medications for fleas and ticks, and various other health problems. Travel and outdoor equipment and gear is also available at Dog.com. Find a great selection of popular brands such as Advantage, Greenies, Petmate, K9 Advantix, Frontline, Dingo and more. So treat your loyal companion right and start shopping at Dog.com. But first, be sure to check out RetailSteal.com for Dog.com coupons, Dog.com promo codes, and Dog.com discounts. Dog.com offers Economy Shipping only in the 48 contiguous states on orders less than 10 pounds of weight for a standard rate of $5.99. For orders over 10 pounds, shipping charges depend on the weight of the order. Standard ground shipping is also an option for the 48 contiguous states. See website for full details, exclusions may apply. Save 5% on all orders with the coupon code at Dog.com. Click to save. Visit Dog.com and save $20 on your purchase over $100. Click here and use coupon code to save. 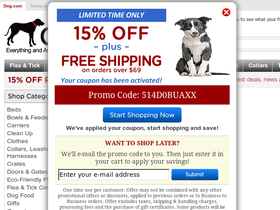 Save $15 at Dog.com on your your order of at least $75 when you enter our coupon code at checkout. Get $5 off any order with the coupon code online at Dog.com. Click link for savings.